Apple products get a lot of attention in the podcasting space, but iOS is actually not the most popular mobile operating system. Here's how you can ensure you don't forget your Android podcast fans! Data from Edison Research, Blubrry, and Libsyn continue to show Apple devices dominate podcast consumption by huge numbers. But there are far more Android devices than iOS devices. Have you heard the story of the two shoemakers in a foreign country? It's a difference of perspective. You might disrespect Android users and assume they're not the “type” of people to consume podcasts. While that may be true in some cases, the stereotype doesn't apply to all Android users. Perhaps the reason most podcast consumption happens on an Apple device is based on the early history and corporate level of support for podcasts. But this is no reason to ignore or especially not to alienate a huge potential audience for your podcast. Imagine getting as many Android subscribers to your podcast as you have iOS subscribers. You would probably see at least a 50% increase in your audience size. Isn't that worth the work? First of all, we should stop saying “iTunes” when we really mean “Apple Podcasts,” since podcasts are not consumed in iTunes on the majority of Apple devices. And if Apple ever releases some kind of podcast-consumption option for Android, it's likely to be called “Apple Podcasts,” and not iTunes. Branding aside, referring so much to iTunes—both in encouraging subscriptions and in asking for ratings and reviews—is instantly excluding anyone listening or watching through an Android device. Keep in mind ratings and reviews do not affect your ranking in almost any podcast app. But if you're going to ask for ratings and reviews, remember to offer an Android option, such as Stitcher. And don't worry about having yet another place to check your podcast reviews, because My Podcast Reviews has been able to automatically collect your Stitcher reviews for years. So I recommend either excluding mention of specific apps or platforms altogether, or being more inclusive of popular Android options whenever you mention “Apple Podcasts” (or “iTunes,” if you keep accidentally saying the wrong thing). My first two suggestions focused on changing your mindset toward Android users. 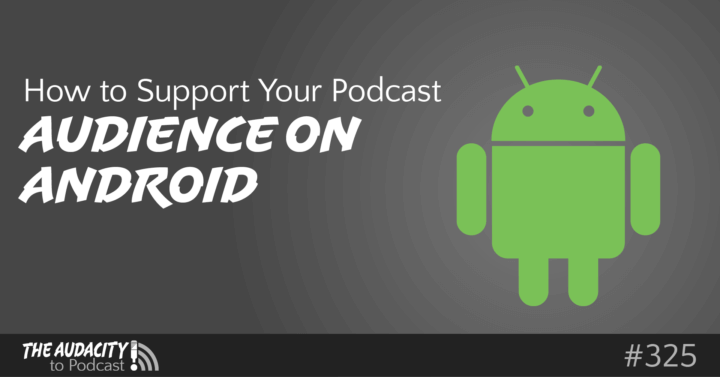 Now, look at the practical ways to support your current or potential podcast audience on Android. It starts by offering a simple Android subscription link. Yes, we probably all have the “Subscribe in iTunes” links, buttons, and icons on our sites. (My own Social Subscribe & Follow Icons plugin is switching from saying “iTunes” to “Apple Podcasts.”) But that's not good enough for Android users—except BeyondPod, which is the only Android app I know that can use an iTunes link for subscribing on Android. Even then, the label still says “iTunes” or “Apple Podcasts,” and thus won't be obvious to BeyondPod users. For a while, Stitcher was the most-recommend podcast app for Android, but Stitcher has lost a lot of market share over the years. However, we can all be thankful Stitcher no longer rehosts your podcast media and now allows users to download podcast episodes for offline consumption. Great job, Midroll and E.W.Scripps (Cincinnati companies!). Nonetheless, Stitcher may not be the best option to recommend to your Android-using potential audience. And since the beginning of blogging and podcasting, a manual RSS link has been extremely popular, but has significantly decreased in recent years. But I think it's still one of the most important links to include on your site, because a direct RSS feed is entirely decentralized and compatible with any podcast app. You may also see some companies, like Libsyn and Spreaker, offer additional-cost options for you to get a standalone Android app for your podcast. I don't think that's a bad option. It certainly has a bunch of benefits (especially in helping podcast-ignorant people easily “subscribe” to a podcast by installing its app). But a standalone app, while only $100 or so per year, might be out of the budget for many podcasters. So what is best for helping your potential audience to subscribe on Android? That's exactly it: SubscribeOnAndroid.com. This is a free, opensource, barely branded option created by Blubrry to help you engage the Android users. Search for your podcast or paste your RSS feed URL into SubscribeOnAndroid.com and you'll get back a slightly altered URL that now works as a one-click subscription option supported by a bunch of the most popular podcast apps on Android. If someone visits your SubscribeOnAndroid.com link and doesn't have one of those great podcast apps already installed, the link will instead recommend those great paid and free podcast apps. There's no approval process for SubsribeOnAndroid.com. It's super simple, and it works great, especially if you then make a friendly URL with your domain, like TheAudacitytoPodcast.com/android. Then, include this Android link anywhere on your site along with your Apple Podcasts and RSS links. The last thing to do is ensure your podcast actually works in the popular podcast apps for Android. That may mean spending only a few dollars to buy the popular apps yourself, or you might be able to ask an Android-using friend to check and test some things for you. Barbara Stevens, from Australia and host of Breakup Recovery, wrote in Apple Podcasts, “… I had no previous experience in podcasting, interviewing people or recording, so I was keen to find a podcast that could give me the knowledge and information that allowed me to feel confident in producing my own podcast. And that is what ‘The Audacity To Podcast’ has done for me. … I am grateful for podcasts like ‘The Audacity To Podcast’ that encourage fellow podcasters to continually improve and achieve amazing results.” Read the full review. Zachary Webb, from the USA and host of Serious About Tech!, wrote in Apple Podcasts, “… I was able to start a podcast, Serious About Tech!, because of what Daniel taught me.” Read the full review. Thank you for this episode. I use Podcast Republic myself to listen to podcasts on my android phone. Since I’m in the starting stages of creating my own podcast (Got Damn Mondays), this was a thought(How do you make your podcast available to android users?) that had crossed my mind and you answered it for me. Thank you. I look forward to the next episode. This was a very helpful episode, Daniel! Thanks! I never miss an episode. Thanks, Dave! What podcast app do you like best on Android? I see CastBox in the list of apps to be sure of, but it’s not anywhere on Podcast Places. Normally I wouldn’t worry about it, but (1) I know several people who use it as their only app, and (2) it looks like you have to host there to be in their directory… which can’t be right, can it?